Do you need an experienced and qualified electrician based in the Kenley area who can offer you the very best in customer satisfaction and reliable service in the following tasks, as well as many others? If the answer is yes then South London Electricians is the right place for you. Based in Croydon and covering the Home Counties and London area we are dedicated to providing the very best in electrical services whatever it is that you need. We are available 24 hours a day, 7 days a week to fix a wide variety of issues and offer tailor made resolutions to both commercial and residential clients. Every electrician that makes up our team has obtained a City and Guilds qualification as well as having plenty of experience in the field, meaning that they can not only provide expert guidance to you when you need it. But also give you that all important peace of mind knowing that your work is being completed to the highest standard. If you are a business then you will be pleased to know that we have the very latest in CCTV equipment. This modern technology allows you to view the footage gathered at your premises remotely, using an iPad or iPhone. A great help when you are travelling but need to keep an eye on your livelihood. However, it is not just the business user that we can help; South London Electricians are there for you at home too. This is especially true in the case of an emergency. Should one arise in your home then call our telephone line and speak to one of our friendly and experienced electricians directly. They will be able to offer you some interim advice before arranging to come and visit you and solving your problem. This will always be completed as quickly as possible and with minimum disruption to your life and property. Our experience is far ranging, from pub and restaurant installations to the smallest task in a home, but each and every project and client we deal with is equally as important to us. 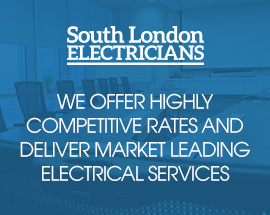 So when it comes to your electrical requirements, why us a second rate electrician, contact South London Electricians and receive a level of service that you deserve, each and every time! Call today on 07956 523316.